Here is a countdown for Christmas widget.Thanks to RomanDA for his fantastic script tutorials.Updated for the current year, and change the design slightly. I think i hit send to many times. This is a very nice Christmas widget, ID. Thanks for sharing. Love it! One quibble though. The word "until" is spelled wrong. Can't believe I missed that. Thanks. I think the script needs looking at again, only 346 days to Christmas ???? I'm not having any problems with the dates. Ditto.. At least I've still got plenty of time to do my shopping. Not sure where you are, but it went haywire after midnight 30/11/2005 here in London, England. but it went haywire after midnight 30/11/2005 here in London, England. Hope it can get sorted, I've been finding it useful. 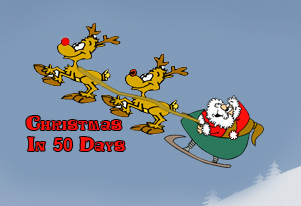 Okay, I know I can change to a non-Christmas themed countdown - but I like this one! I'm sorry but it works fine here. Maybe the date format is different in other countries and that might be the problem. Maybe the date format is different in other countries and that might be the problem. So it'll work on 12/25/2005? I'll have to check but I don't think we have 25 months here? Please fix it so it works for countries who format dates correctly. It's ok. Fixed it myself. And yes it is due to the date formatting. tut tut. Okay, do share - how do we fix it? line 09 is now...... TimeOfMovie = "12/25/2005 0:01:0"
line 09 is now...... TimeOfMovie = "25/12/2005 0:01:0"
But, yes that's what I did. I like fixing problems when they're easy.